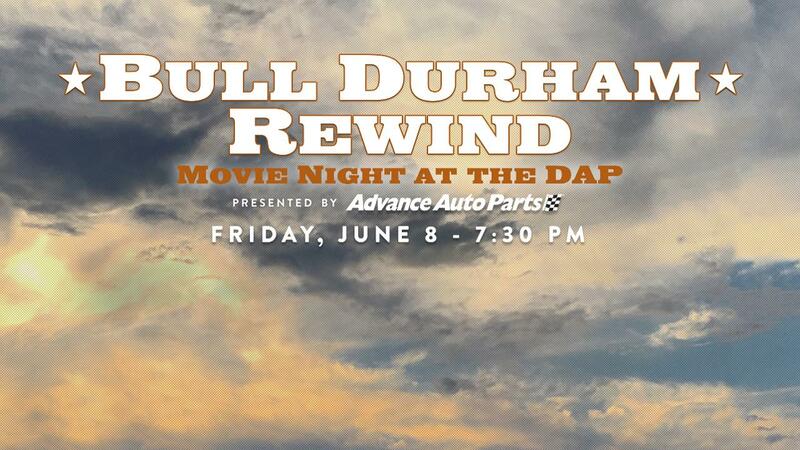 DURHAM, NC - As part of the celebration of the 30th anniversary of the film 'Bull Durham,' the Durham Bulls are hosting "Bull Durham Rewind" at historic Durham Athletic Park on Friday, June 8, presented by Advance Auto Parts. Fans will have the opportunity to watch the movie at one of the flick's main filming locations, and the event is free and will be capped at 2,000 attendees. The movie will be shown on two screens at the historic stadium, with one facing the grandstand and the other in shallow centerfield. Fans will have the opportunity to sit on the outfield grass and watch the movie from the field itself, or view the film from fixed seating in the stadium's stands. All seating is general admission and will be filled on a first-come, first-serve basis. Gates will open at 7:30 p.m. for the event, and the movie will begin at approximately 8:45 p.m. to ensure it is dark enough to see the screen. Local food trucks will be in attendance, and Bull Durham Beer Co. will be served. Additionally the team's Bull Durham characters Crash, Nuke and Annie will be in attendance for photo opportunities, as will the mascot from the movie and Wool E. Bull. "This is an excellent chance to take a trip down memory lane for many of our fans," Durham Bulls Vice President Mike Birling said. "As we continue to celebrate the 30th anniversary of the best sports movie of all time, we thought this would be a perfect way to capture the nostalgia of 'Bull Durham,' while allowing our fans to enjoy the DAP once again." The R-rated film will be shown unedited and in its entirety, and some content may not be suitable for children under 17. All attendees 16 and under must be accompanied by an adult. Tickets are free and can be reserved by clicking here, and the event will be capped at 2,000 attendees. Parking will be available in the area surrounding the ballpark, including the parking lot of Measurement Inc. located on Morris St.
For a full list of guidelines for the event, including prohibited items, please click here.